What Streak Triggers and Actions are Supported? Updated Box - Triggers when a Field on a Box is updated. Task Due - Triggers when a Task becomes due, but it not yet completed. Box Change Stage - Triggers when a box changes Stage. New Box - Triggered when a new box is created. Task Complete - Triggers when a Task is completed. New Comment - Triggers when a Comment is made on a Box in a Pipeline. Box Change Pipeline - Triggers when a Box is moved between Pipelines. Updated Contact - Triggered when a contact is updated. Box Email Received Count Change - Triggers when the counter for emails received on a box changes. New Contact - Triggered when a new contact is created. New Task - Triggers when a Task is created. Create Email Filter - Create an email filter that's part of a box. Add Contact to Box - Checks for an existing contact based on email address. Creates a new contact or updates the existing contact and adds the contact to a specified box. Link Boxes - Link multiple boxes together. Create Comment - Create a comment on a box. Update Contact - Update a contact by providing a contact key. Create Task - Create a new Task on a Box. Add Organization to Box - Checks for an existing organization based on website. Creates a new organization or updates the existing organization and adds the organization to a specified box. Edit Box - Edit fields, stage, assigned to, name and notes on an existing box. Create New Box - Create a new box. Get File by File Key - Retrieve a file by providing the file key. Edit Task - Edit a task by providing box key and task text or by providing a task key. Create Meeting / Call Log - Create a new Meeting or Call Log on a box. Get Full Thread by Key - Gets a full unified thread given a thread key. Find a Box - Find a box by name, key, or fuzzy query. Find a Contact - Searches for an existing contact by contact key, box key, or other information (like email address). Find an Organization - Searches for an existing organization. 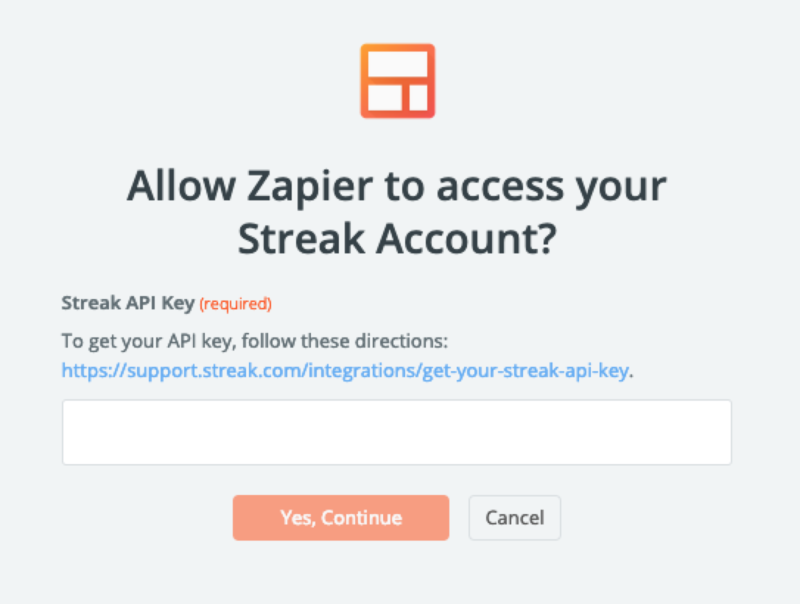 The first thing you'll need to do to get started with hooking up Streak with Zapier and hundreds of other services is to add your Streak Account to Zapier. 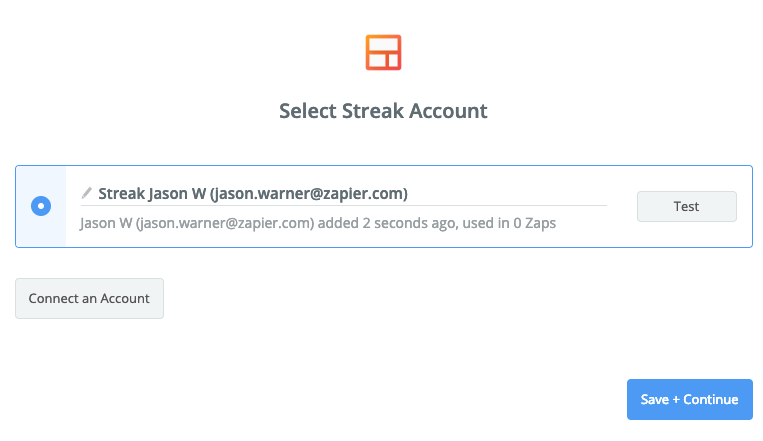 Click to add a Streak account in your Zap. 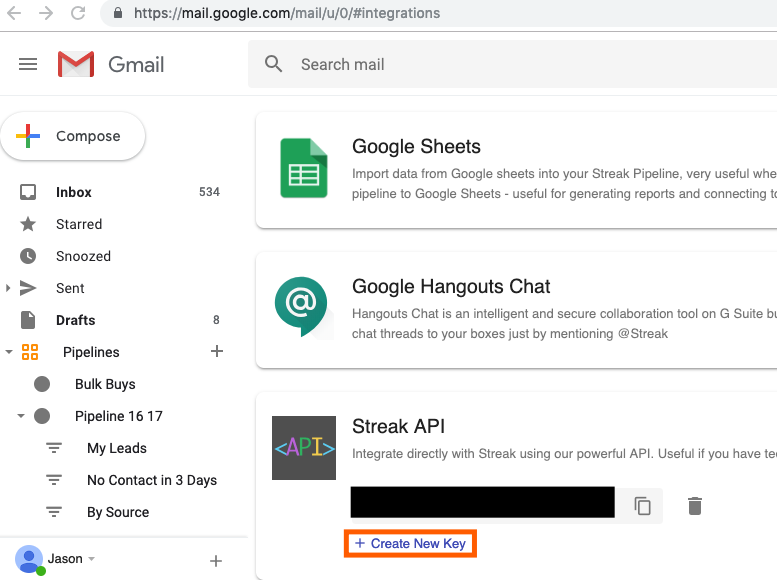 You'll be asked for your Streak API key. 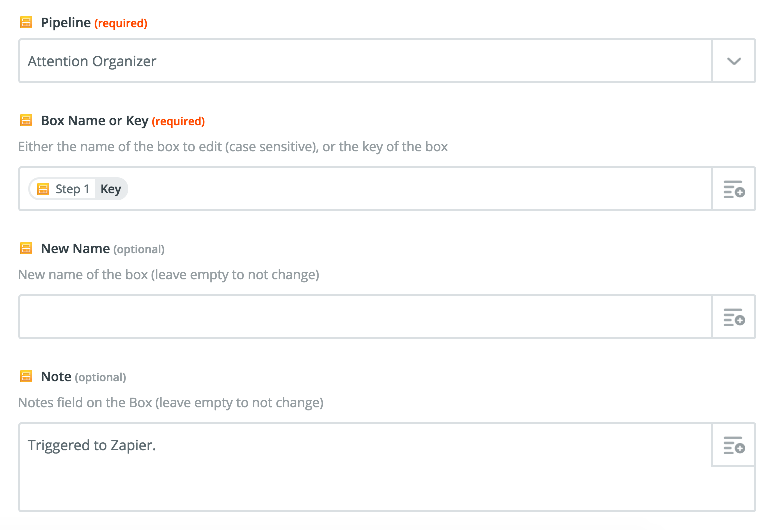 If you don't have a key yet, click the Create New Key button, then paste this back into Zapier. Streak limits creating boxes with to less than 2048 characters. A workaround is to use the formatter to truncate data sent to create the box to less than 2048 characters. This usually means you've deleted a field from your pipeline, so the field key is invalid. To fix, reselect the pipeline on the action, it should update the custom fields to the ones that are available. This trigger will fire every single time a field is updated in a box. So, if you update 4 fields in a box, the updated box trigger will result in 4 tasks. If you want it to only trigger once, you'll need to add a filter and an Edit Box step to your zap. One example of this would be as follows. Start with a filter that looks for the Notes field not containing "Triggered to Zapier:"
That way, the first field that is updated will trigger and pass the filter, then update the Notes field. The subsequent fields won't pass the filter. These fields are just an example, you can use any field you want for the Filter and Edit Box actions. An email address cannot be used as a filter on more than one box. When you see this error, that usually means the email address was already in use as a filter on another box.